Planar hydrocarbon‐like metal clusters may foster new insights linking organic molecules with conjugated π–π bonding interactions and inorganic structures in terms of their bonding characteristics. However, such clusters are uncommon in polar intermetallics. Herein, we report two polar intermetallic phases, Pr5Co2Ge3 and Pr7Co2Ge4, both of which feature such planar metal clusters, namely, ethylene‐like [Co2Ge4] clusters plus the concatenated forms and polyacene‐like [Co2Ge2]n ribbons in Pr5Co2Ge3, and 1,2,4,5‐tetramethylbenzene‐like [Co4Ge6] cluster in Pr7Co2Ge4. Just as in the related planar organic structures, these metal–metalloid species are dominated by covalent bonding interactions. Both compounds magnetically order at low temperature with net ferromagnetic components: Pr5Co2Ge3 through a series of transitions below 150 K and Pr7Co2Ge4 through a single ferromagnetic transition at 19 K. Spin‐polarized electronic structure calculations for Pr7Co2Ge4 reveal strong spin‐orbit coupling within Pr and considerable magnetic contributions from Co atoms. This work suggests that similar structural chemistry can emerge for other rare‐earth/late‐transition‐metal/main‐group systems. This is the peer-reviewed version of the following article: Lin, Qisheng, Kaiser Aguirre, Scott M. Saunders, Timothy A. Hackett, Yong Liu, Valentin Taufour, Durga Paudyal, Sergey Budko, Paul C. Canfield, and Gordon J. Miller. 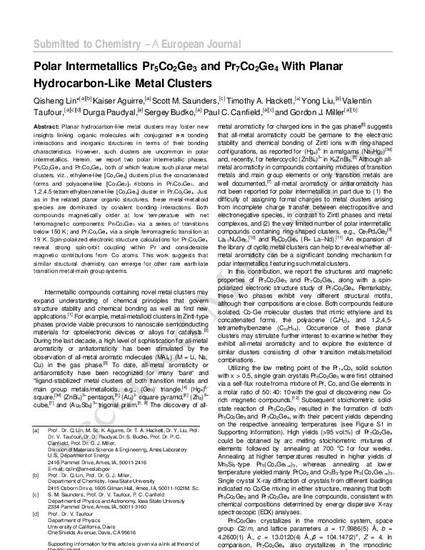 "Polar Intermetallics Pr5Co2Ge3 and Pr7Co2Ge4 with Planar Hydrocarbon‐Like Metal Clusters." Chemistry–A European Journal 23, no. 44 (2017): 10516-10521, which has been published in final form at doi: 10.1002/chem.201702798. This article may be used for non-commercial purposes in accordance with Wiley Terms and Conditions for Self-Archiving. Posted with permission.